Calendar of events for Brigid's Crossing and Shabby Cat. 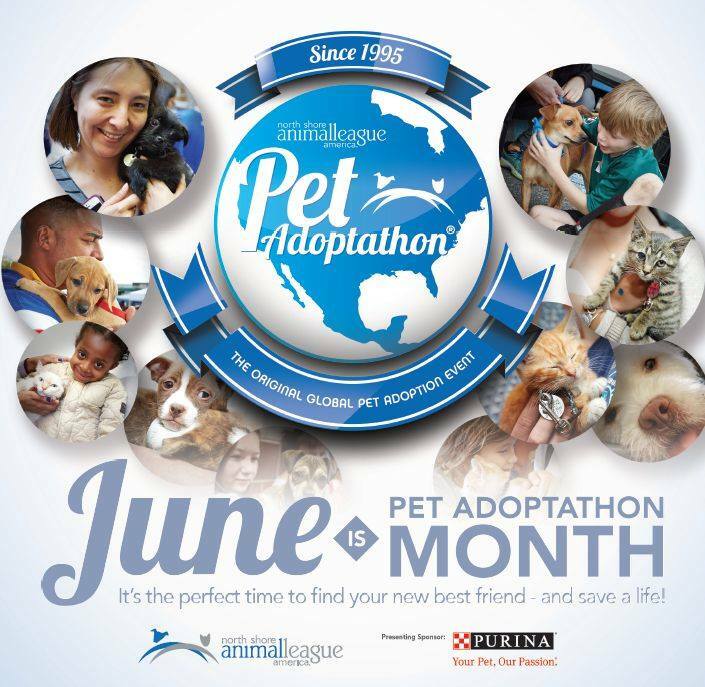 This June Brigid's Crossing will be hosting "Paw Palooza"�as a part of the North Shore Animal League's Pet Adoptathon at Shabby Cat in Naples. Several adoptable cats will be featured in the adoption center, each one still looking for his/her forever family. Could this be you? Stop in and spend some time with these amazing cats. Sale items will also be featured throughout the store, all proceeds from their sale benefiting the rescue cats of Brigid's Crossing. Meet special guests such as Heather Burch, the co-founder of Brigid's Crossing, and take the opportunity to speak with our compassionate, knowledgeable staff about all of your cat care questions and concerns. Ready to adopt? Adoption specials will be in place for the duration of the event. Half-priced adoption fees, 2-for-1 adoptions for those who fall in love with more than one cat, and a free bag of Feline Pine litter with each adoption. Celebrate Pet Adoption Month and stop by Shabby Cat to pick up your raffle tickets for a chance to win a custom clayboard pet portrait by D.Branchaud. The winning ticket will be drawn on June 20 at our Pet Palooza Adoption Event. Raffle tickets are $1 for 1 ticket, $5 or 6 tickets, $10 for 12 tickets, or $20 for 25 tickets. All proceeds will help the rescue efforts of Brigid's Crossing. Help support the rescue efforts of Brigid's Crossing this summer at "Paw Palooza" June 19-20 from 10am to 5pm at the Shabby Cat store 963 4th Ave N in Naples. All donations will be graciously accepted, be it monetary or gently used items. Visit www.brigid.com to view a complete wish-list of cat care items needed at the sanctuary. For more information call 239-263-6019 or email info@shabbycat.org. Next weekend is our monthly adoption event at Shabby Cat, "Pounce Into Summer"! On Friday and Saturday, May 15-16 we will be featuring several amazing adoptable cats, as well as sale items throughout the store. We will also have a single grand raffle prize available to win this month: a custom Clayboard pet portrait by D.Branchaud. A unique and lovely tribute to your feline or canine friend. Get your raffle tickets this week at the store! 1 for $1, 6 for $5, 12 for $10, or 25 for $20. Shabby Cat is located at 963 Fourth Avenue North, Naples, Florida. Open Tues-Sat 10:00am to 5:00pm. We're pleased to welcome back Donna Lynn Hudgins for Intuitive Spiritual Readings on Friday, April 17, 11:00am to 4:00pm. $20/20 minutes. Very popular and not to be missed. A portion of receipts gracefully accepted for Brigid's Crossing. Thank you Donna! We will also be providing information for new and potential volunteers during the event for those who are interested in helping hands-on with the cause. There are new raffle prizes up for grabs! Raffle tickets can be exchanged for donations in the following amounts: 1 for $1, 6 for $5, 12 for $10, 25 for $20. Raffle prizes include a limited edition Paul Arsenault framed "Pies for Pets" print, a Bird Catcher Pro Interactive Teaser Cat toy with refills, Free yoga and lunch for two at Shangri-La Springs and a small custom pet portrait by Danielle Branchaud. You can donate for tickets at the Shabby Cat store during our business hours Tuesday-Saturday from 10am-5pm until the last day of the event. Winners will be drawn at 4:00pm on April 18th. There is a silent auction item also available during the month of April. A private luncheon for 8 at Shangri-La Springs, a value of $1,200. Minimum starting bid is $400. All proceeds benefit the rescue efforts of Brigid's Crossing. Minimum bid is $400. Item value $1200. Simply register at 32auctions.com to participate. Join us for April "Feline Frenzy" at the Shabby Cat resale store and adoption center on Friday or Saturday the 17th-18th, from 10am to 5pm to support Brigid's Crossing! 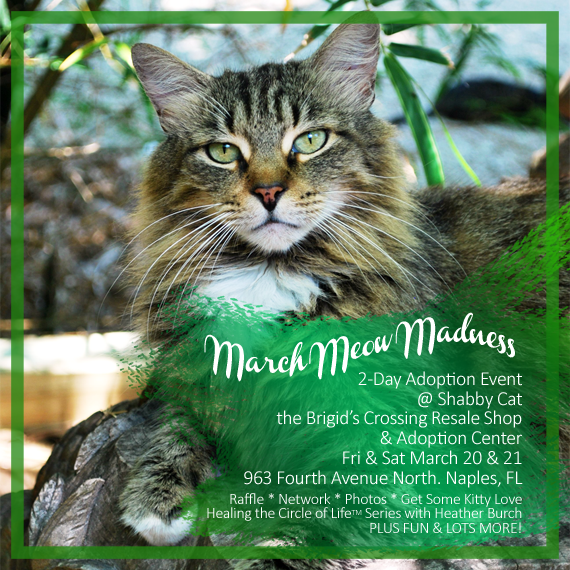 This is a FREE PUBLIC adoption event at Shabby Cat, the Brigid's Crossing Resale Shop and Adoption Center located at 963 Fourth Avenue North in the Naples Design District. We're pleased to welcome back Donna Lynn Hudgins for Intuitive Spiritual Readings on Friday, March 20, 11:00am to 4:00pm. $15/15 minutes. Very popular and not to be missed. A portion of receipts gracefully accepted for Brigid's Crossing. Thank you Donna! Purr...fect combination–Healthy Chocolate Tasting, Friday, March 20 Noon to 3:00pm. International Guest Speaker at 1:00pm. Activities will include the Healing the Circle of Life™ discussion series with Heather Burch, the BCF photo op outside the storefront, BCF Matchmaker Draw your Dream Cat Coloring Activity, raffle prizes and of course playtime with our adoptable kitties! What would your dream cat be like? Maybe she's black with a white chest, or he's brown with tiger stripes, or maybe flecked with all the colors of the rainbow! We have a cute activity for children (and our creative cat-parents) that we will have set up for "True Love is a Cat" on February 13th and 14th. But there's no reason you can't have a little fun now. You can download and print this pdf at home! Color in the provided cat image, and send us the results! Maybe we can make a match! Or bring in the colored pages to our Shabby Cat store during the event. We will proudly display completed activity sheets to show the support and love for cats from those of all ages! Adoption specials will also be in effect for those who fall in love with one of our kitties. A $30 dollar adoption fee, free bag of Feline Pine litter and 2 for 1 adoptions if just one furry friend isn't enough! You can donate for Raffle Tickets in person at Shabby Cat – 963 Fourth Avenue North, Naples, Florida 34102. Shabby Cat is open Tuesday-Saturday, 10:00am to 5:00pm. All monies donated contribute to the Brigid's Crossing Foundation (BCF) and their animal rescue efforts. The "True Love is a Cat" raffle drawing will begin on Saturday, February 14, 2015 at 4:00pm at Shabby Cat. Unless present at time of drawing, raffle winners will be contacted by phone at the time of the drawing announcement. BCF is not responsible for failure of said calls should the contact number be illegible or incorrect. It is the responsibility of all raffle participants to properly fill out raffle information at the time of entry with first/last name and phone number to contact. In the event that phone contact could not be made, raffle winners can also follow progress of drawing and announcements via social media (Facebook/Twitter/Instagram) and make contact via email (info@shabbycat.org) should the call not go through. If raffle is for multiple prizes, winners will be drawn consecutively. After each prize is drawn for, those winning participants are automatically ineligible for the drawings that follow in that same raffle. There will be one prize for each winning participant, in order to allow fair odds to all those who participate. Winner must claim prize within one week (7 business days) of announcement. Prizes will be held at the Shabby Cat store at 963 4th Ave N, Naples, FL 34102 during this time. Pick up must be made at the store during business hours (Tues-Sat 10am-5pm). If winner does not claim prize within one week of announcement, prize will be re-donated to future raffle events. Winners of previous raffles are eligible to enter new raffles as they occur under the same rules and regulations. Participation in raffle does not guarantee a winning prize unless indicated in current raffle description (i.e. door prizes). Raffle ticket pricing are suggested donation amounts. All raffle prizes consist of donated good or services. No purchase is necessary to participate in our raffle. We will be posting on Facebook, Twitter and Instagram leading up to and live throughout our event, be sure to stop by our neighborhood on the social network! If you can't attend, consider making an Online Donation to Brigid's Crossing. Whatever you can give, a lot or a little, all amounts make a difference! 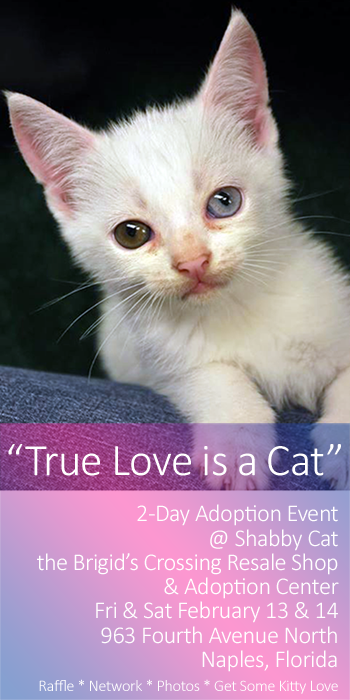 "True Love is a Cat"
An adoption event at Shabby Cat, the Brigid's Crossing resale store and adoption center, at 963 Fourth Avenue North in Naples, FL. In addition to adoptable cats there will be activities for the whole family, including the Photo Op back-drop that we had at the Christmas Walk in December. We're pleased to announce the return of Donna Lynn Hudgins for Intuitive Spiritual Readings on Friday, February 13, 11:00am to 4pm. $15/15 minutes. Very popular and not to be missed. A portion of receipts gratefully accepted for Brigid's Crossing. Thank you Donna! Friday 1:30 - 2:00 pm "How to identify the early signs of illness in a cat." Presented by Heather Burch, co-founder Brigid's Crossing Foundation. 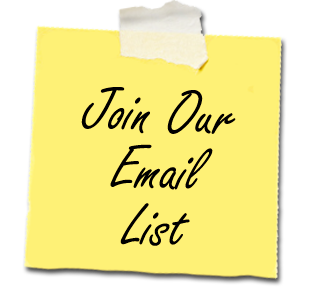 Includes handouts and time for questions and answers. Saturday 1:30 - 2:00 pm "How to make your own homemade cat food." Presented by Heather Burch, co-founder Brigid's Crossing Foundation. Includes recipes and time for questions and answers. Saturday 2:30 - 3:00 pm. Information and Orientation for folks interested in fostering and volunteering. A portion of all receipts will be gracefully accepted for Brigid's Crossing and their animal rescue efforts. Come out and Support Brigid's Crossing at the Holiday Tree Lighting on 5th! Brigid's Crossing will have a booth. Come out and show your support for the kitties! Bring friends and family for this annual tradition on 5th Avenue South as local choral groups, dance troupes, school and church choirs and the community come together for the holidays and the traditional lighting of the Tree. Festively decorated storefronts and windows, twinkling lights and Stores open late with holiday cheer! And, don’t miss Santa and Mrs. Claus as they pose for photos and hand out candy! Immediately following the lighting of the Tree and decorations, activities will kick off on 5th Avenue with choral groups, musical ensembles, dance troupes and community groups with Holiday activities until 8:30 p.m.
Come out and Support Brigid's Crossing at the 4th Annual Halloween Spooktacular on 5th! Brigid's Crossing will have a booth. Come out and show your support for the kitties! Mark your Calendars for the 4th Annual Halloween Spooktacular on 5th! This exciting family fun event is scheduled from 4:30 to 9:30 on Halloween—Friday, October 31, 2014. Location: Fifth Avenue South, Naples, Florida. The entire month of June we will focus on finding homes for our adoptable cats. GRAND PRIZE includes: plush adjustable cat bed, "Black of Night" book signed by the author, "Cat Calls" book signed by the author, 1 Laurel Birch t-shirt, Yeoww Stinkies catnip sardine toys, Cat's Meow battery powered cat toy. Karma and Coconuts Boutique $25 gift certificate for an arts and crafts class for two, Won by Cheryl C.
A gift basket with a painting and note cards by Marie MacLean. Won by Tena W.
Home Depot Gift Card for $50. Won by Sarah L.
Custom Pet Portrait by Nova Art Studio. Won by Marie P.
Grand Prize including custom Pet Bed, "Hypno Kitty" signed art print, "Cat Calls" book signed by Authors Joanne Adlon and Susan Logan, "Black of Night" book signed by author Jennifer Charon Ward, Laurel Burch T-shirt and the "Cat's Meow" cat toy. Won by Sally D.
Yahoo! Congratulations! Thank you everyone for your support! Complimentary lemonade and cat cookies, yum! During the Adoptathon, watch for our posts on Facebook, Twitter and Instagram. Please Share & Like! Thank you! Stroll Fourth Avenue North and browse for fabulous finds. We will be showcasing our Shabby Cat goods in front of our store during business hours. Select Household Items, Clothing and other items will be marked down to Yard Sale Prices. So walk, run or fly over and enjoy! Select Household Items, Clothing and other items will be marked down to Yard Sale Prices. We will have a Sidewalk Sale every month for Shabby Cat. Select Household Items, Clothing and other items will be marked down to Yard Sale Prices for 1 Day A Month. Donna will be creating her one-of-a-kind beautiful intuitive prose written exclusively for you or your loved one. All donations gracefully accepted for Brigid's Crossing Cat Sanctuary. If can't attend, consider making an Online Donation to Brigid's Crossing. Whatever you can give, a lot or a little, all amounts make a difference! Shabby Cat will have live music, sweets made by our favorite volunteer MJ, great sales. Plus the shops on the street will have events going on at the same time. Great fun for the family and who knows you may find a great kitty to adopt. 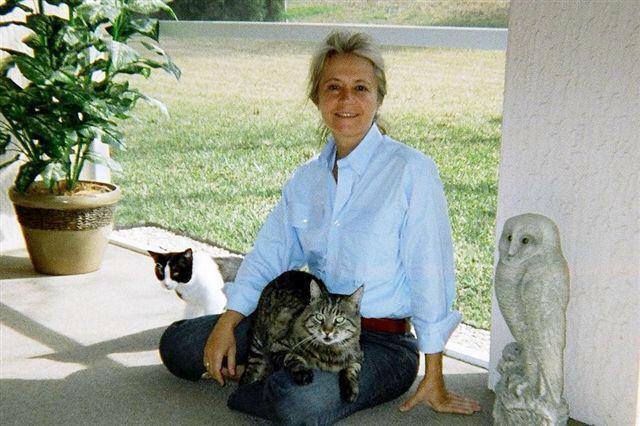 On Saturday, February 2, 2013 from 2 - 4 pm Emmy Award-winning journalist Cathy Unruh will appear at the Shabby Cat resale shop with her formerly feral cat, Lucy Miracle, to celebrate their new adventure novel, "Taming Me: Memoir of a Clever Island Cat." Narrated by Lucy, the novel offers an intimate look at the thoughts and emotions of a cat as she struggles to survive in the wild and learns the intricacies of human interaction. Animal behavior scientist Jonathan Balcombe raves, "Unruh brilliantly captures the inner world of a cat," while journalist Darlene Arden remarks, "You'll cry, you'll laugh and you will love Lucy." 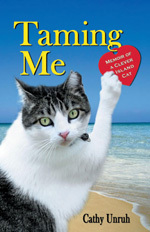 Published by Collage Books, Inc. in Naples, "Taming Me" has received immense support from Alley Cat Allies, The Humane Society of the United States, Neighborhood Cats of New York City, Farm Sanctuary, Florida Voices for Animals, actress Loretta Swit, and popular authors Rory Freedman and Carolyn Haines. "Taming Me" is featured in the December issue of "Cat Fancy" magazine. Unruh and Lucy Miracle have appeared on numerous TV and radio programs throughout the country. 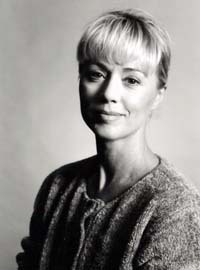 Cathy Unruh hosts a talk show for WEDU-TV and is a frequent speaker and emcee in Tampa, Florida. She is also an award-winning member of the Cat Writers' Association. She grew up on a hobby farm and is passionate about animal welfare. This novel champions her views about the humane treatment of animals. Located in the Naples Design District at 956 Second Avenue North, Shabby Cat is a resale shop offering designer dresses, shoes, jewelry, furniture and other upscale items. The shop also facilitates cat adoptions on site. The shop's proceeds benefit Brigid's Crossing, a non-profit cat rescue and holistic sanctuary in Naples, Florida. Their phone number is 239-263-6019. Availability: Cathy Unruh and Lucy Miracle are available for appearances and interviews by arrangement and via telephone or Skype.